The BBC has confirmed it is pressing ahead with major changes to its radio streams, accessed by dedicated tabletop internet radio receivers, which has left many listeners unable to access on-demand and listen again programmes and shows. The BBC has announced that, at the end of this week (Friday, 27th Feb) it has ceased all WMA (Windows Media Audio) feeds of its radio stations and catch-up services. In addition, it has stopped normal AAC-encoded streams of its stations. Internet radio receivers generally use either of these two formats to stream radio stations over the internet. However, the BBC has confirmed it will continue to offer universal MP3 streams for legacy radio receivers, to give radio manufacturers an opportunity to update the software in their receivers via an "over the air" update or via a download, so that they can support the BBC's new streams. This means that streaming radio users can try temporary 128k streams for all stations, plus a temporary, high quality 320k AAC stream for BBC Radio 3, which will be kept going until the end of the BBC Proms 2015. Ninety-nine percent of internet radio receivers can access both MP3 and AAC streams. The BBC's plan is ultimately to offer an optimum audio stream based around new http chunked streams. This means compatible receivers will be able to switch "on the fly" between high and low quality streams without lots of pauses and breaks in the programme being streamed. The BBC will also offer a tandem open-source system called MPEG-DASH alongside the http chunked system (HLS) for its stations. In a blog post, Andrew Scott, General Manager of Radio Product for BBC Future Media, said he was "genuinely sorry" for listeners whose devices couldn't be upgraded to support the new streams. The BBC also confirmed that it was looking to reintroduce BBC Five Live and Five Live Sports Extra for UK listeners, as geo-locked MP3 streams. Currently, due to broadcast rights, Five Live Sports Extra cricket and football coverage must be turned off on the "international" MP3 stream provided for UK and overseas listeners. This has led to a number of angry comments from UK-internet radio listeners unable to hear the cricket world cup. A recent edition of BBC Radio 4's In Touch has been discussing the implications for listeners with visual impairments and radio listeners may have to replace their receivers, if the firmware in their units can't be successfully updated to access the BBC's listen again or on-demand services, which will all be provided in HLS or MPEG-DASH formats. The BBC did however confirm that a range of MP3 podcasts will be maintained for some popular speech programmes where broadcast restrictions mean that music can't be played in full on the podcast. The BBC's changes don't affect DAB digital radio and listeners to the BBC's DAB coverage and transmitter roll-out continues as normal. Not all internet radios experience issues with the BBC's listen again service. Recent updates made last year to Pure's One Flow, Evoke F4 and Pure Sensia 200D Connect mean that these receivers can handle the higher-quality HLS chunked feeds and continue to stream BBC on-demand "listen again" content - both podcasts and full-length music shows. Pure, however, confirmed on 16th December last year that many of its older products would no longer be able to stream listen again programmes provided by the BBC. The receivers affected are Pure's Avanti Flow, Sensia, Siesta Flow, Evoke Flow, Oasis Flow and the Sirocco 550 micro system. 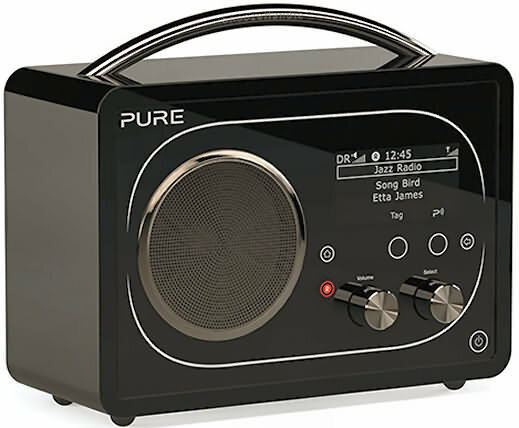 The Pure Evoke F4 is one of a handful of products including the One Flow and Sensia 200D Connect that can handle the updated high-quality streams provided by the BBC, plus all listen again shows and podcast content. While the idea behind internet radio receivers is to offer access to thousands of stations around the globe, many listeners have been using their radio to stream the BBC's stations and catch-up programmes, without having to switch on their computer or download an app to their smartphone. The advantage of a one-box solution that could sit in the kitchen or living room, or be easily connected to a hi-fi system is very appealing, particularly where DAB and FM reception is poor. Unfortunately, for many people, these changes will foce a rethink of how to access the BBC's radio services by alternative means, by TV, smartphone, or a PC or tablet. The new streaming methods seem to provide the BBC better control over who gets access to its streaming links, reinforcing the BBC's own iPlayer Radio apps and portal as the primary way of listening to its stations and programmes over the internet. However, owners of expensive equipment, and blind or visually-impaired listeners, are poorly served by this technological progress. England, NI, Scotland & Wales national radio services, on this website.